New York Police & Fire Widows’ & Children’s Benefit Fund Chairman Daniel J. “Rusty” Staub walks across the stage to give his opening remarks. Photo Credit: Ibrahim Dabo. 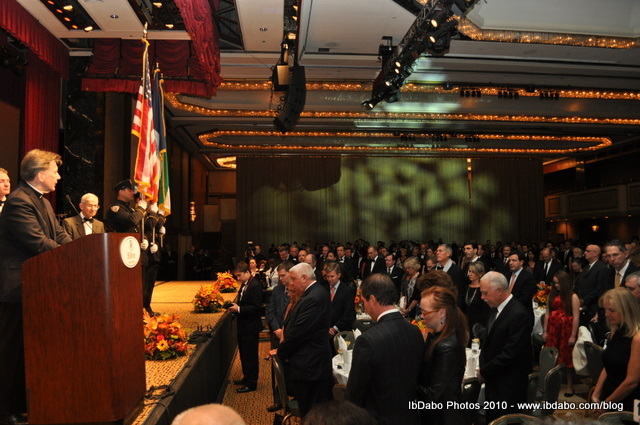 New York City, New York—The New York Police and Fire Widows’ & Children’s Benefit Fund held its 25th Annual Benefit Dinner at the New York Hilton on Nov. 4 2010 and honored three influential leaders in their respective fields who have helped make a difference. Citigroup CEO Vikram Pandit, entertainer and entrepreneur Shawn “Jay-Z” Carter, and Warner Music Group CEO Lyor Cohen, were all honored in a packed-to-capacity Grand Ballroom. Benefit Fund Chairman Daniel J. “Rusty” Staub (L) looks on as Benefit Fund CEO Stephen J. Dannhauser gives his remarks. Photo Credit: Ibrahim Dabo. “I think for anyone who attended this event tonight, you will get the really family sense that we have created, raising money for a very important cause, for the families of those who have died in the line of duty,” New York Police and Fire Widows’ & Children’s Benefit Fund CEO Stephen J. Dannhauser told Ib’s blog in an exclusive interview. Dannhauser said it is not just about raising the funds but the creation of a meaningful network to make a difference in the lives of others. “We have created this human network, where as you just saw, this woman just came to me and said, ‘thank you for what you are doing.’ No thanks to me. “It is in my judgment our obligation as citizens to help people whose lives have been shattered and that’s all we are trying to do,” said Dannhauser, who is also Chairman and President of Weil, Gotshal & Manges LLP. Dannhauser also praised this year’s honorees for the good work and contribution they have made toward the cause. 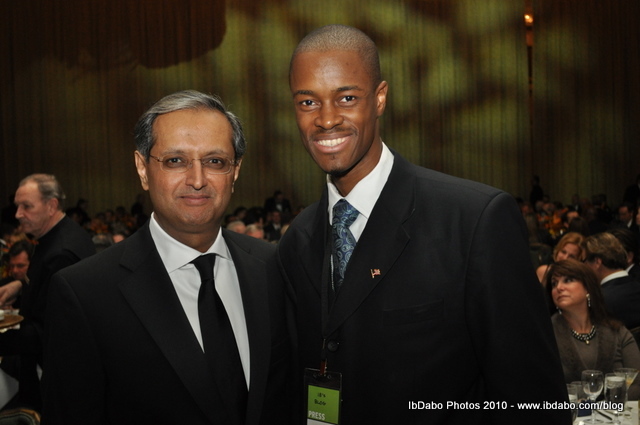 Ibrahim Dabo (R) congratulates Citigroup CEO Vikram Pandit (L) after he received his award. Photo Credit: Isseu Diouf. “Vikram Pandit is an extraordinary man. The CEO of Citigroup did a great job,” Dannhauser said. Benefit Fund Chairman Daniel J. 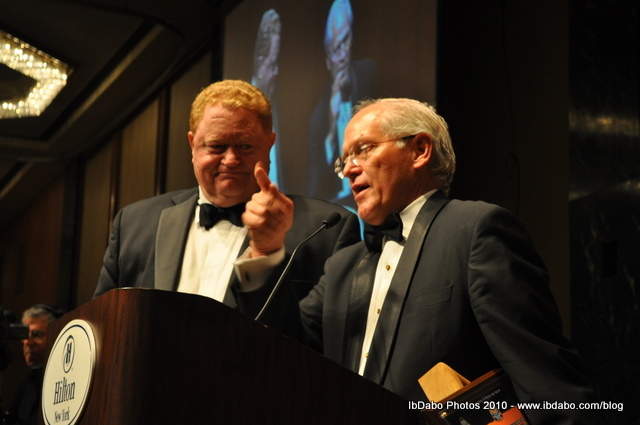 “Rusty” Staub, who was one of the founders of the organization, talked about the importance of the event in an exclusive interview with Ib’s Blog. 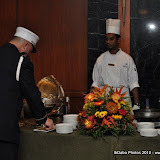 “It is the 25th year we have been able to have a dinner to benefit the widows and children of policemen and firemen, and port authority and EMS people who have been killed in the line of duty—given up their lives for this community,” Rusty told Ib’s Blog in an exclusive interview. The Grand Ballroom at the New York Hilton was packed to capacity. This year’s Benefit Gala raised $1.5 million. Photo Credit: Ibrahim Dabo. “It is important. These people make the ultimate sacrifice. They try to make our lives better. “To say that we owe them a debt, I would say that is an understatement,” said Rusty, who is also a baseball legend. Rusty said his organization is doing its best to ensure they can assist the widows and children financially. In his award acceptance speech by telecast, Jay-z said, “I want to thank the New York Police and Fire Widows and Children Benefit for this award… in my honor. I am very humbled by the ‘Answer the Call’ award. On Sept. 11 2009, Jay-z helped raise nearly $750,000 through the “Answer the Call” benefit concert when he performed at the Madison Square Garden in New York City. 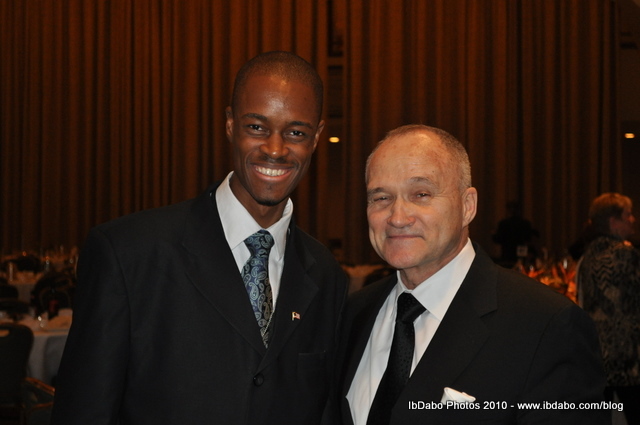 New York City Police Commissioner Raymond Kelly, who is a former honoree and board member, acknowledged the work of the New York Police and Fire Widows’ & Children’s Benefit Fund when he spoke to Ib’s Blog in an exclusive interview. “Twenty-five years of providing funding for widows and orphans of police and fire is a tremendous, tremendous charity and we are indebted to them because they provide things for our widows and orphans that even some departments can’t provide,” Kelly told Ib’s Blog. This year’s Benefit Gala kicked off with a cocktail reception followed by a dinner and live auction, which was led by George Whipple of NY1 News. 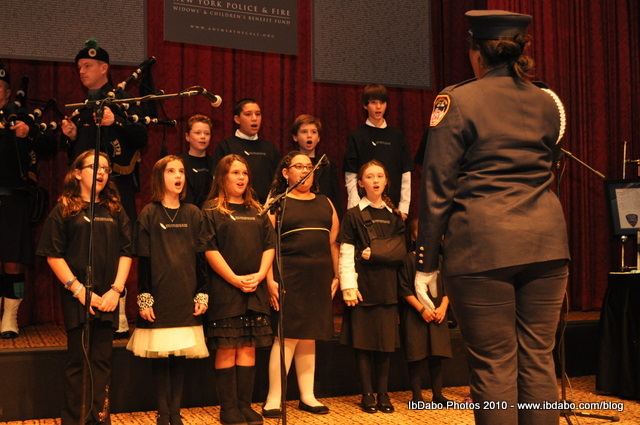 Children who have lost their dad in the line of duty sang the national anthem at the gala. Photo Credit: Ibrahim Dabo. Other prominent guests included Hockey Hall of Famer Mark Messier and New York City Fire Commissioner Salvatore Cassano. This year’s Benefit Gala raised $1.5 million. The New York Police and Fire Widows’ & Children’s Benefit Fund, since its inception in 1987, has distributed nearly $120 million to families of New York City police and fire personnel who have been killed in the line of duty. The fund was originally created to assist families of New York City fire fighters and police officers during their loss, but now includes the families of Emergency Medical Services and Port Authority officers. The annual financial assistance provided by the Benefit Fund has grown from 320 families to approximately 700 families. For more information, visit The New York Police and Fire Widows’ & Children’s Benefit Fund website. Click on album below for Gala photos by Ibrahim Dabo.